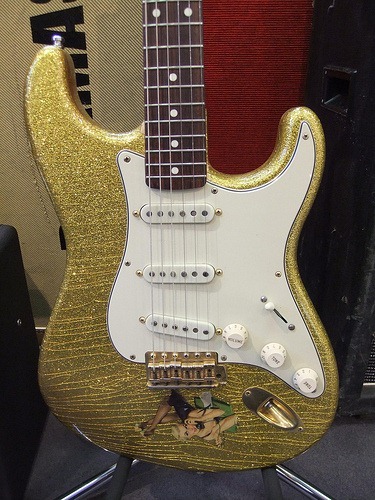 Pictured above is Joe’s legendary Fender Stratocaster, known as “Goldie”. The guitar will be auctioned off in March at Bonhams auctions in NYC. The guitar was originally on display at the Rock and Roll Hall of Fame for sometime. The auction will also feature guitars from Eric Clapton’s personal collection and donations from Jeff Beck and J.J. Cale. I gotta say that looking at Goldie sitting there with a price tag makes me a bit short of breath.. That guitar traveled so many miles with me. A foot note about it.. When I was 19, I was at rock bottom. I lost my record deal, I had a horrible squeaky voice. I tried several different styles of music and fell flat on my arse. It was the most crossroads time of my life. I actually gave up the guitar.. I sold all my guitars.. 10 in all to my dad and at vintage guitar shows and gave up for 6 months.. But, the only guitar I kept was….. you guessed it.. Goldie. Its is with mixed emotions and a pure heart that this guitar goes to a good home.. 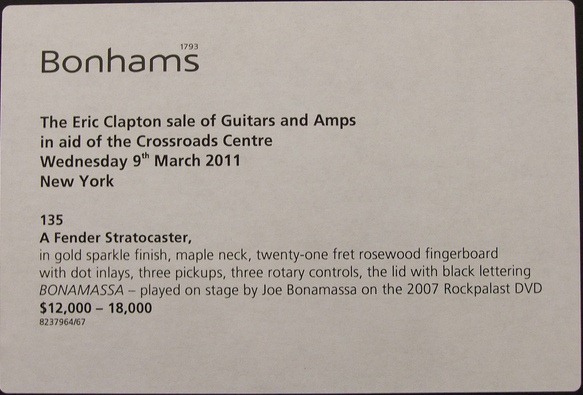 Above is the information displayed with the guitar, with an estimated price of $12,000 – $18,000. Many people think it will go above that, which will not surprise me if it does. Many thanks to Wooders for the pictures. You can check out the full gallery here. I think I read this guitar was pieced together. Do you happen to know from what? Body year, neck year, pickups & electronic years?